One bite reveals a dark, rich, molten chocolate center. Served warm, this dessert tastes like a celebration. When we got word that the seller had accepted our offer for our new home, Jack and I both thought “Champagne!” With that not being possible in Point Hope, we went for the next best option – a gourmet celebration meal. Jack created a perfect dinner of seared strip steaks topped with bleu cheese and garnished with a sautéed medley of onions, mushrooms, and garlic. He served the steaks with carrots and parsnips sautéed with a hint of maple syrup. Foil-wrapped baked potatoes and sour cream finished off the plate. My contribution was dessert. I had read several recipes for molten lava chocolate cake that sounded just right – rich, warm, chocolate and sized to serve individually. I adapted my version from a blog that had scaled down the recipe to two. Jack had purchased these beautiful ramekins when he lived in Japan. My original thought was to serve the cakes in the ramekins as pictured. I decided to experiment with mine and inverted it. The jam spread perfectly under the cake. I dusted the inverted cake with a bit more powdered sugar. It was a perfect end to a perfect meal. Preheat oven to 400 degrees F. Butter two ramekins and place on baking sheet. Set aside. In a double boiler, melt chocolate chips and butter, stirring until smooth. Scrape chocolate mixture into a bowl and add powdered sugar. Mix until incorporated. Add egg and whisk until smooth. Stir in flour and vanilla extract until smooth. Pour batter into prepared ramekins and transfer baking pan to oven. Bake for 12 minutes. Cakes should puff to surface of ramekins. 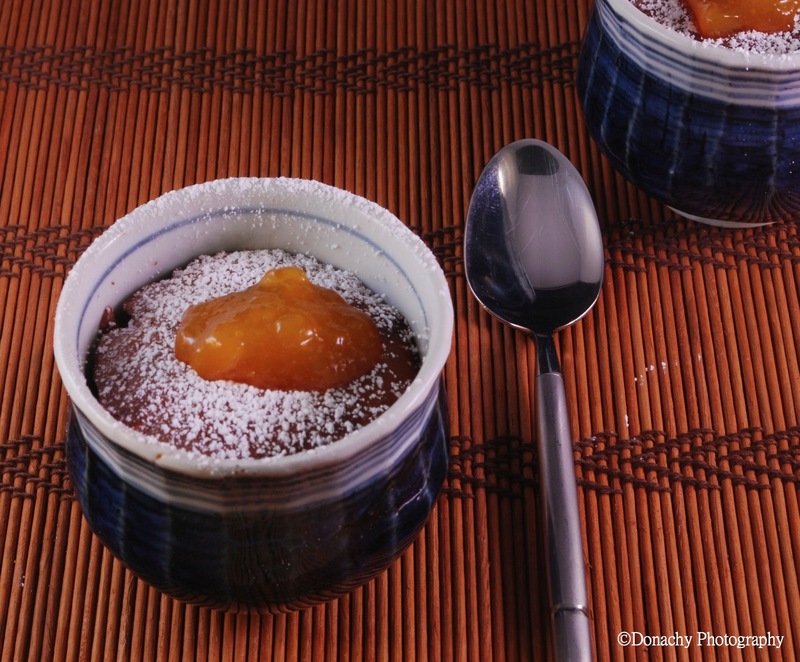 Place a dollop of raspberry or peach jam on cake before inverting onto plate. 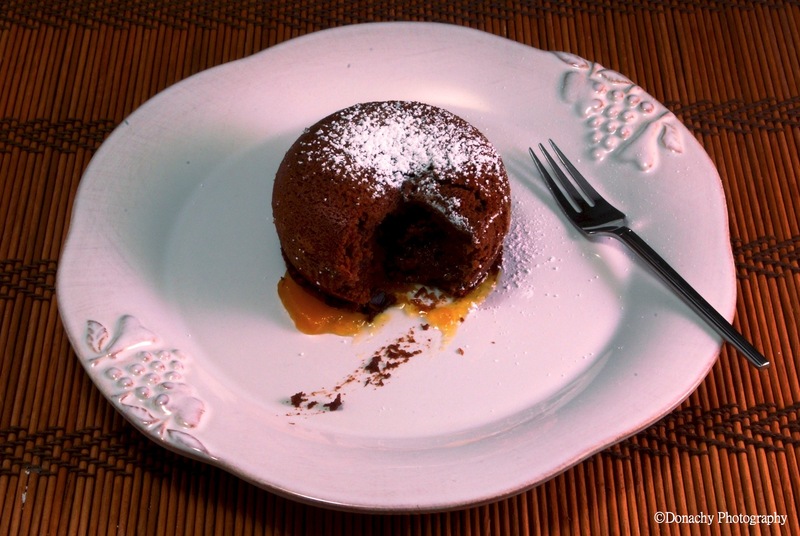 Love chocolate fondants, one of my favourite desserts – yours looks beautiful. Thanks for reading! These are a favorite!